I love books. Like, really love. Like, still-use-my-library-card-every-week love. And I'm a huge fan of reading non-fiction books during any stage of life where you don't feel like you are 100% confident on the best ways to succeed in that stage (i.e. every stage of life). College success books are awesome (e.g. if I didn't think that I wouldn't have written one), but sometimes once you get out of college is when the real learning (and confusion) begins. When I graduated I brought stacks and stacks of books home from the library, devouring them with hopes to uncover some secret treasure map to lead me out of this crazy post-graduate jungle of confusion. While I never found that map, the books taught me that the map doesn't exist - no one has it. And that made me feel so much better. The books also gave me practical tips on what to do and how to survive in this new world without exams and grades and awards and constant-friends. Below are my top three favorite post-grad books (in no particular order) that I highly recommend in order to get your post-grad life started on the right foot. Life After College by Jenny Blake shows you that while there is no magical treasure map, there is such thing as a practical road map to help you see the big picture and figure out what you want to do with your life. She shares the practical road map that helped her on her journey - a journey that led her to a job as a Career Development Program Manager at Google. Jenny writes in a way that makes you feel like she is sitting across from you at a coffee shop, sharing her story and advice. That's how she is in real life too. She is seriously one of the nicest people I've ever met. Jenny chronicles her experience as an overachiever who felt burned out at age 25. It all changed when a career coach asked her "What do you feel like you were born to do?" This is a perfect book to get with a few friends and talk about once a week for a few months. I actually started a post-grad book club out of college when I was feeling super lonely - and it was amazing. This is a perfect book to start with. 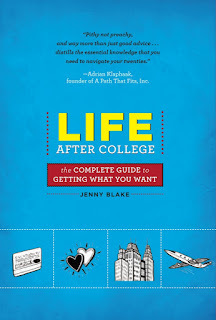 You'll want to read Jenny's book with one of those pens that have a highlighter on the back. It is really a workbook that invites you in to be the author of your own life. From figuring out your core values to learning how to still have fun and relax in adulthood, this book will bring you into that conversation. And the treasure you will uncover at the end of this road map, is you. 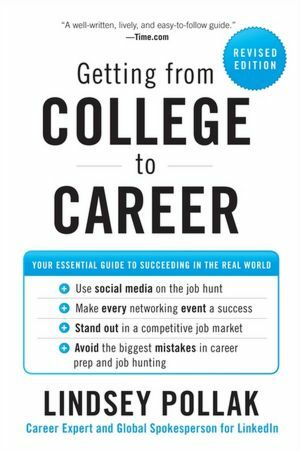 Getting from College to Career by Lindsey Pollak is a fantastic books that embodies the idea that career exploration is an adventure. As Lindsey puts it: "I didn't know my right career path until I saw it, heard it, touched it.This is why throughout the book you'll notice my obsession with taking action, trying new things, meeting new people, and having a wide variety of experiences" (p.xiii). Lindsey's book is packed with practical tips to get you moving in the right direction to discover more about yourself and the opportunities that are out there for you. 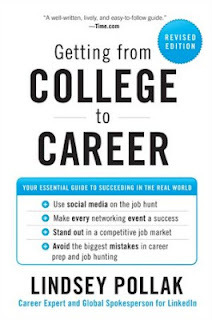 This is a book to act on now - while in college - and when you graduate. It lays out everything you need to do before you walk into that first interview. It will get you moving fast towards getting your first job out of college. 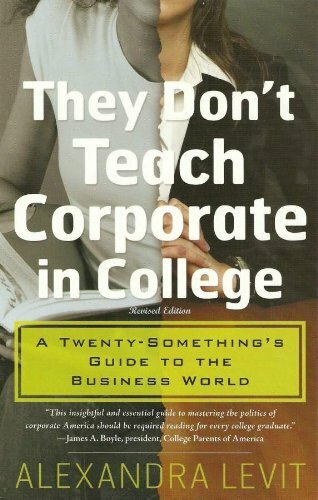 They Don't Teach Corporate in College by Alexandra Levit is a great reminder that while getting your first job out of college seems like the hardest part, sometimes managing the new corporate world is the real battle. School is comfortable. As Alexandra puts it, "We know how the story goes: if you work hard, you get good grades and everyone is happy. The business world, however, is another animal entirely" (p.17). While Alexandra explains no one holds your hand or is there to break your fall on the corporate ladder, her book will make you feel like she is holding your hand the whole way. You can enter the corporate world without this book and you will learn most of the lessons it shares - but you will learn them the really hard way. And many people never come to understand how to use the things Alexandra teaches in this book to move forward in their careers and their lives. Reading this book will give you a huge advantage. Each of these books will clear out new paths that you didn't know existed - and warn you against the treacherous ones - as you begin your adventure-trek into adulthood and the "real world." Happy reading! Jenny, Lindsey, and Alexandra are also all pretty wonderful people and dynamic college speakers - you can follow them on Twitter.